Launching a boat requires a different approach depending upon the wind direction at the time. Do it wrong, and you could be facing an expensive repair bill! Launching a boat requires a different approach depending upon the wind direction at the time. Traditionally, it used to be considered best to not hoist the sails until the boat was in the water; however, if the water is too deep, or conditions too dangerous (e.g. waves etc), the boat can be rigged on the trolley on land first. It is important to remember, the boat should be sat on it's trolley properly; if the wind gusts, it is less likely to push the boat off its trolley and damage it. 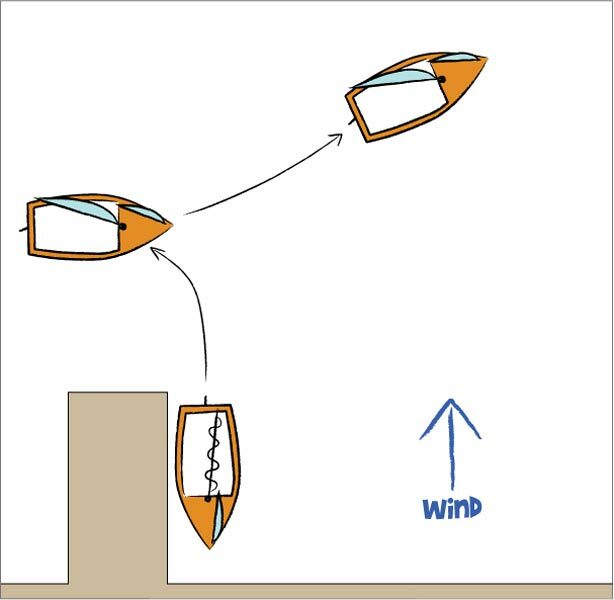 Also, it is best to point the boat head to wind to rig it, that way the sails will flap and not be powered. To launch, choose your spot wisely. Remember boats can be heavy, even on the smallest of slopes. Ensure you are free of obstructions, especially to leeward of the boat when launched, because that is the direction the wind will push it in. 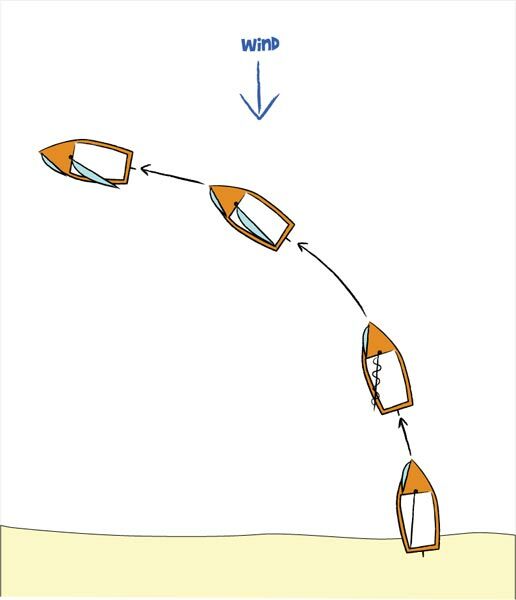 If the sails are hoisted, aim the boat head to wind when approaching the water so the wind does not catch the sails and move the boat, and make sure no-one is in your way when launching, especially on a slipway. Also, make sure the centerboard and rudder are raised otherwise you may hear a nasty grinding noise! Launching into a wind blowing onto the shore can be difficult. 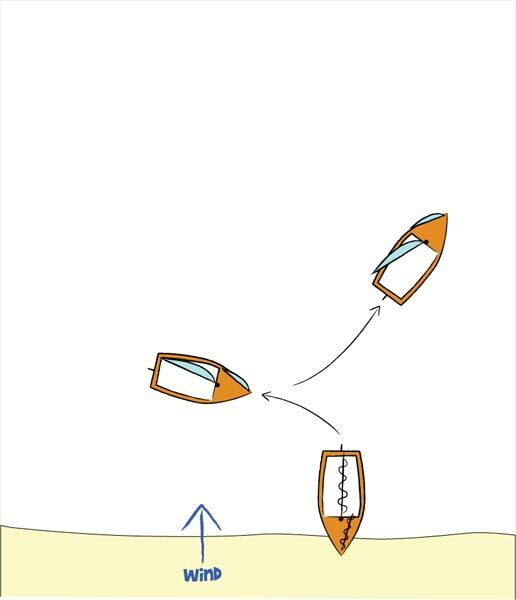 Try to launch on a beam or close reach, rather than close hauled, because you may have to luff up (turn higher into the wind) to avoid being capsized by oncoming waves if sailing in a coastal area. 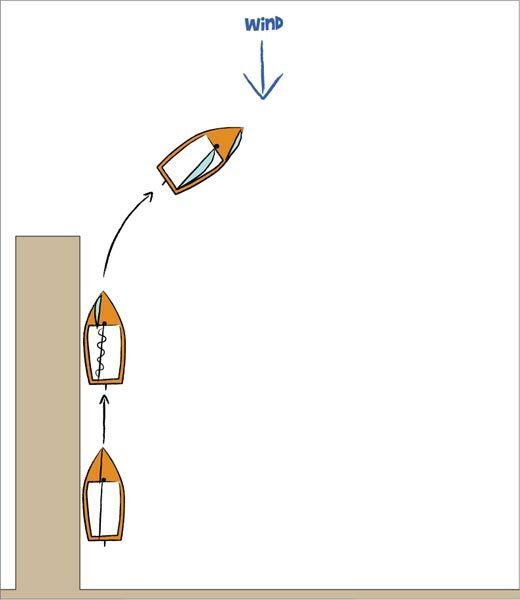 Also, sailing on a beam or close reach is typically faster than close hauled, so you get away from the shore quicker (see Fig 1). Also, you should try not to tack through an onshore wind, and sailing on a beam or close reach lowers the danger of requiring a tack. If launching from a pontoon, the boat should be launched and turned head to wind. The helm should step aboard, the sails should then be hoisted, and the rudder and centerboard lowered. You should then sail away as for a shore, avoiding sailing close hauled (see Figs 2 and 3). With an offshore wind, the water and conditions will generally be calmer. 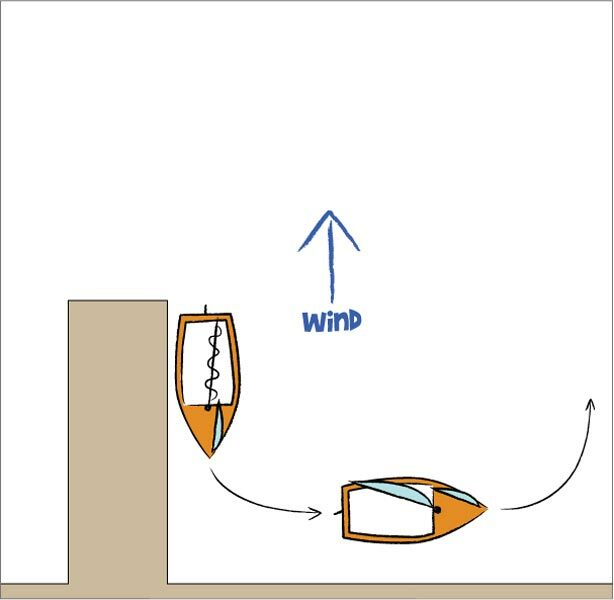 The boat should be set head to wind initially, the sails hoisted and the centerboard and rudder lowered if the water is deep enough (see Fig 4). The crew then turns the boat until it he is on the windward side, and climbs in. A course can then be chosen; it is advisable not to sail directly downwind offshore, and instead sail slightly off downwind. A similar approach can be taken to launching from a pontoon (see Fig 5).